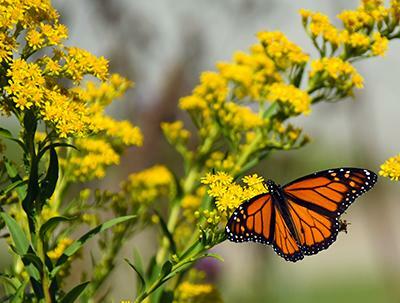 abundance to your yard, there is no better choice than planting a meadow with native plants. Not only is a mature meadow a stunningly beautiful sight of waving flowers with butterflies and birds darting in and out, but it’s virtually maintenance free, and provides the natural food and nourishment birds who are in and also migrating through the area need at the time. And fall is the best time to get your meadow started as some of the seeds require cold or freezing temperatures before they will sprout. Seeding before winter sets in will give you a head start on the growing season. I have a native meadow which is nearing maturity and it is one of the best things I have ever done for wildlife and for myself — the increase in bird and butterfly activity once the plants started growing and flowering was immediate and far beyond what I had expected. Full disclosure though, it’s not an overnight or completely simple thing to do. I hired The NJ Wildlife Gardener, Josh Nemeth, from the Cape May, NJ area to do mine as I have no competence whatsoever in landscaping or with plants in general. Josh selected a specific seed mix that was native to the area and which he knew would be irresistible to birds and butterflies. The area to be planted was covered in decades-old grass, so he covered the grass in plastic so it would die off and be easier to remove. Then the area was seeded in the fall. It needed some watering to get the seeds started, and then some during the late spring and dry summer months the following year. But that was the end of the watering maintenance. Josh also selected a number of shrubs and bushes to add both additional visual interest and variety, but also to ensure there would be food and shelter available year round for birds and wildlife. I was told it takes about 3 years for the meadow to take hold, and indeed that has been the case. Honestly, it was a little depressing in year 2 as I was getting impatient and the plants really seemed to not be progressing as I thought they should! But this is the third year and the results have been stellar and well worth the wait. My meadow has everything from grasses, goldenrod, roses, iris, milkweed to cattails and chokeberry. As a result, I had all sorts of birds diving into my meadow for a respite during spring migration, new species of birds who took advantage of the extra food and safe haven to nest in my yard during the summer and now in fall, there are large flocks of birds and untold numbers of butterflies using my meadow for food and shelter as they pass through to parts farther south. The shrubs are ripe with berries, flowers are bursting out everywhere and the variety of butterflies flitting around is stunning! Plus, it looks so beautiful and my neighbors love watching what’s going on in my yard! You don’t need much room to have your own native meadow. And whatever time it takes pays off big time once the meadow is up and running! So, now’s the time to get started! 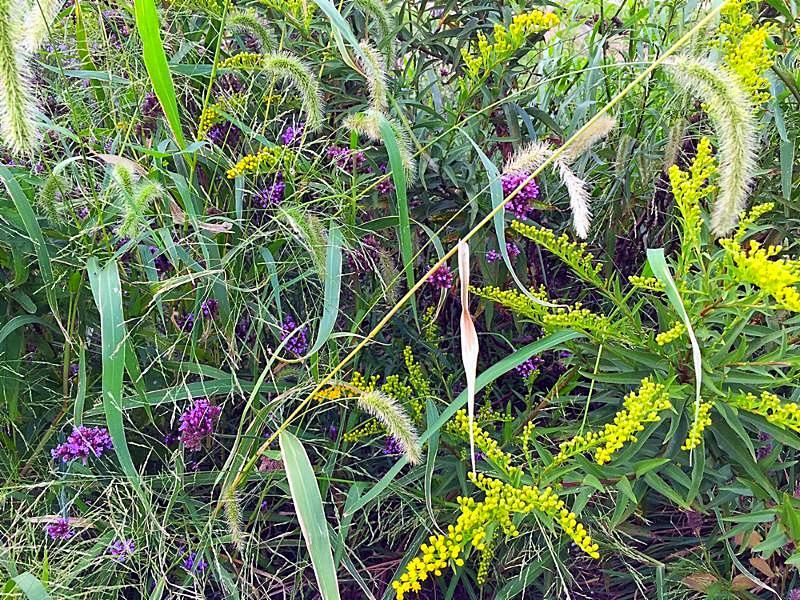 For most of us, It makes sense to have a professional native landscape designer and gardener help you get the design and the right seed mix, and get it all started. You may want to add a water feature or different sections or habitats if you have the space. Someone who does native plant landscaping and gardening will know what to do and have the resources to get native seeds and plants for you. If you are a do-it-youselfer, check out the how-to pages from the Lady Bird Johnson Wildflower Center, get out your shovel and order those seeds!